I'll be straight right off the plate, we never made our 1 year journey on the open road around the country in our 5th wheel. We made it to the starting line and life changed tragically for us again. 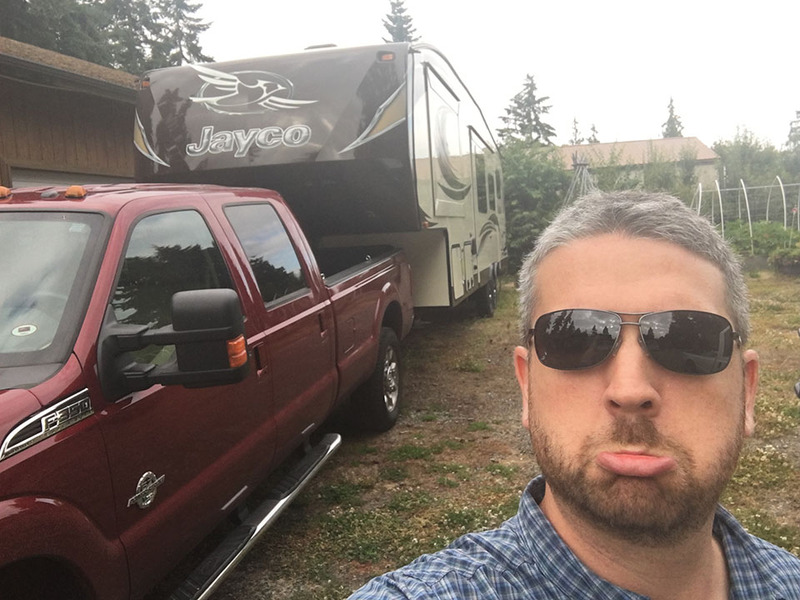 We parked in my mother-in-law's driveway and lived in the 5th wheel for 9 months with 2 small kids, a cat, and me still working through it all. We made 2 trips around the Washington area to get our wits about us and then we were going to hit the road. This post is about the journey to that point and what my family and I learned from the experience. These are lessons many people learn in their own ways through their own challenges and tragedies. I thought I'd do my own small part in sharing our lessons so as to potentially prepare a reader in a small way for something like this. I hadn't written much of the details down until this post and I hope it can be both inspiring and a reality check on getting deeper with yourself and your relationships to be able to weather potential catastrophic upheaval in your life and its transitions. This is a joyous transition bookended by tragedy. I hope you find something useful here. Most obvious answer is really, who wouldn't want to? A much more uncommon experience: My mother passed away suddenly and tragically in March, 2013. The circumstances I'll leave for a later post but for now, just know her passing was more than catastrophic to us, our whole family, her friends, her community, and the school where she was a well respected teacher. Our grief was deep and wide and persisted for some time. I was now the sole income generator for the family and not only that, I had to be a co-executor for my mom's estate. This is like having one full time job plus a part-time (but nearly full time hours) job as an Executor. The story goes though, specifically relating to a 5th wheel adventure on the open road, when our family was on our way for a bike ride we passed a farm house with a big Class A RV. I said to my wife Michelle, with little thought, "We should just huck all our stuff and get one of those and live on the road, go see the country and our family and friends, to heck with all this non-sense we've been through..." And we had a few comments about it but left it at that. Well, I found out 2 weeks later that I had planted a seed in Michelle's mind that had blossomed to a new vision for our family. I caught her talking to the wife of a friend we had about the notion of getting a 5th wheel and leaving for a while. "WHHHAATTT?!??! That's the first I've heard about you taking that seriously at all!" And so it began. We were committed from that point on. From there, we both went into action and I brought bare a few methods and tools to help us plan for this transition and move forward as fast as made sense. Clear Vision for The New Life: Michelle and I already had a sort of a life vision and 5 year plan and so we took all that learning and understanding of our values and really dug into what we wanted to make of this adventure. We wanted it to be educational for our whole family, deepen relationships with friends, family, and new people we'd meet, and broaden and strengthen our relationship together through it all. There is a lot of detail beyond this but what really manifested was we started a blog called RVingForLife.com and started posting before we even left on the trip, about what we wanted and how we were preparing. The depth of the name for us was in the fact that it was a new life for us for a while, as well as we were going to share our story about various tragedies in our lives and speak to others about theirs and collect money for a few foundations that meant something to us dealing with disease and ailments our family had been afflicted with and ultimately passed away from. Additionally, we wanted to contribute to brightening life across America by hosting communal dinner events at the campgrounds or communities we visited (we both love cooking and I'm a Dutch Oven cooking aficionado) and we'd also facilitate deep conversations with these folks on a variety of topics. That's the philosopher in me coming out. At least, that was the idea behind the vision. State Our Assumptions and Challenge Them As Needed: We spent time diving into this vision, our plan, where we were in life, and extracted a variety of assumptions we had about it that needed to be clearly articulated, discussed, and challenged. One simple one I recall had to do with the timeframe we'd be on the road. Events seemed to line up with a likely disembarking in winter 2015 and our daughter Lila would have kindergarten starting the following fall. I really dug into the need to start her in kindergarten in the fall instead of the following winter term. We weighed the options and decided while it's not a perfect scenario, 3-4 more months on the road would mean so much more to our family than having to figure out how to get back to ordinary life and get her into school. Write Out An Integrated Plan: Being a planner and engineer by nature and education, I felt for this to work and us to stay sane individually and as a family, we had to have our priorities straight and the timing of things out in the open and visible for us. So naturally I got a white board up on the wall and we pieced together the puzzle of the major streams of life and the sequence of events that were going to happen. We decided we had 3 distinct streams that each had important elements to be worked as well as some cross-over dependencies. The streams were: my work life at Boeing, our current personal life (both before and after the trip), and then the pieces specifically required for our journey. We laid them out, challenged dependencies, accelerated some things and pushed others off. Doing something like this with a complicated transition helps in so many ways I can't really say enough. We weren't 100% strict on things but seeing things flow helped us communicate so much more effectively, get the things done we needed, and understand the critical elements that had long lead times to getting done. This plan spanned about 8 months time, included all the work we had to go on my mom's estate as well as the streams I mentioned before. This also inspired us with a feeling of ownership and progress as we were still reeling for our recent tragedy. Our plan came together about the time we needed it to and we moved out of our house, got rid of a ton of stuff, the rest went in a storage unit, and we bought a new truck and the 5th wheel. We moved into Michelle's mom and step dad's driveway and began the start of our transitioning life. Continuously cultivating and enriching your relationships will help you weather any storm life throws at you. My wife and I went to even newer depths of understanding and relationship through this experience. We also grew closer with other family in our area in a variety of ways only this sort of trauma to a loved one can bring. The lesson here seems cliché but there is endless depth to the truth "never take your relationships for granted, in life or in business". Even in tragedy find ways to strengthen, deepen, and enrich those relationships. Challenge your ruts and how you may think "you are" in the various relationships in your life. We found we tend to have a lot of baggage we pile into relationships that really has nothing to do with them directly. Lots of stuff from your past history that's more about defense mechanisms and protecting your perceived sense of self or your ego. Do this work pays dividends beyond your wildest imagination. Life can happen in 10 square feet or in other words you can live in ways and spaces you may not think are possible. My fondest memory of this time (amid the storm of Michelle's moms trials) was sitting on the couch in the RV, attempting to take a "zone out" moment before I had to deal with some RV maintenance task, while Michelle folded clothes, our son played with his tractors on the floor, and our daughter showed us her latest dance moves. This was all taking place in approximately 10 square feet of floor space. What a contrast it was, to be living in this 5th wheel, having been inspired by and planned this journey amidst tragedy, trying to live and enjoy life in 10 square feet, when in the bigger picture we were in the middle of another epic tragedy unfolding everyday. We were making it all move forward, such as it was. This also plays into how incredibly resilient we are as humans but more about how our children were in the late hours to and from the hospital and observing all the stress and emotion around them. We parents tend to project WAY too much on our children and assume how they can and will be in hardship. This first hand experience with them continues to teach me daily about their resilience and adaptability beyond anything I could have pictured before it. Transitions though tragedy and hardship provide many lessons and will forever, if you reflect and learn. I continue to have new insights and learnings, almost daily, upon reflecting what we witnessed across my father's 10 year illness and passing, my mother's death, and my mother in law's passing. Pay attention and deepen your experience, face your harsh reality and you will learn a great deal. We humans have innate tendencies to try to avoid pain but pain is also one of our greatest teachers. The pains through these times were unavoidable but my family and I have grown so much more out of all of it. No, we're not perfect by any means, but I feel as though the depth of experience we have to draw on is vast and so if we can take the time to reflect and apply our lessons, we come out of hard times faster and more easily. These tools and lessons I've shared in this post are only a few and are some of the most important. Much of what life has brought and taught us through these tragedies and healing is why I'm doing the work I'm doing now at Next Callings. I hope to do good work and apply my lessons to ease many of the innumerable transitions we have in life and I hope this post helps someone in even a small way. I welcome comments or emails if you'd like to talk more. This post is dedicated to my father, Bill Prestin, my mother, Chris Prestin, and my mother-in-law, Sharon Caster. May they all Rest In Peace.